Kev is one of the most romantic man I know. His love language is gift-giving especially to his wife, Jo of A Feast. 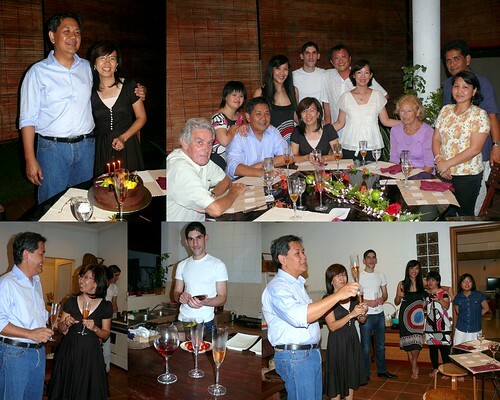 Kev loves to give Jo presents (I still remember that one of his first gifts to her, when she was in Form 5, was a bottle of Joy perfume and a watch) and surprise dinners on her birthdays and their wedding anniversaries. I remember a surprise birthday dinner at TABH one year and poor Jo was the worst dressed among the guests because she thought it was an ordinary family dinner. For their 30th wedding anniversary (gosh, they were precocious! 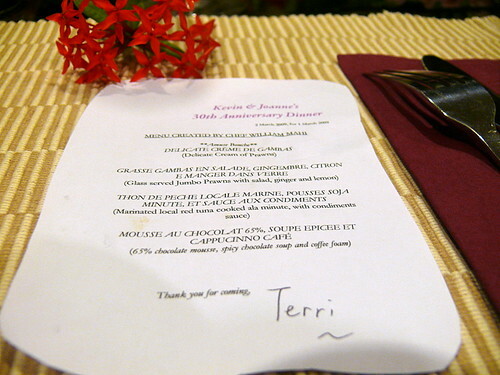 ), Kev offered to splash on a big celebration dinner and to take Jo to Bangkok and Singapore but she insistently refused. He was a little upset. What Kev didn't know was that Heather, their beautiful daughter who works in Shanghai, had plans for a celebration weekend and dinner for her parents' anni. She had to let her mom in on the plan so that her dad wouldn't whisk her away. It was such a well-kept secret that Kev couldn't even recognize his first child as she walked through the gate a couple of days ago. Part of the reason was probably she had a French man in tow. William is a young French chef (do all French man have a bod like yours, plus cook like you?) who works in Shanghai and what better way to meet your gf's parents than on a surprise visit where you are to prove your culinary skills to a couple who cook and talk food all the time. Of course if you're working as head chef in a top restaurant that is vying for 2 Michelin stars, you'd be confident enough to take on such a challenge. Last night's dinner was limited to a prestigious few: Kev's best friend Brian and his wife Jo, Kev's bro Reuben and his wife Lina (Ben was best man at their wedding, as he resminisced in his toast), and my Hub and I, me being Jo's best friend I hope (Jo, I have been blessed by your friendship all these years). Brian and Kev were colleagues and some of you know who Brian's famous son is but since they love KK and want to live here incognito, I won't be telling. Rueben and Lina are excellent cooks too, I'm told, although I've yet to attest to that (are you guys reading this??). I've had too much cheap champagne and this giant bottle from Moet & Chandon is proof that you mustn't scrimp on fine things. 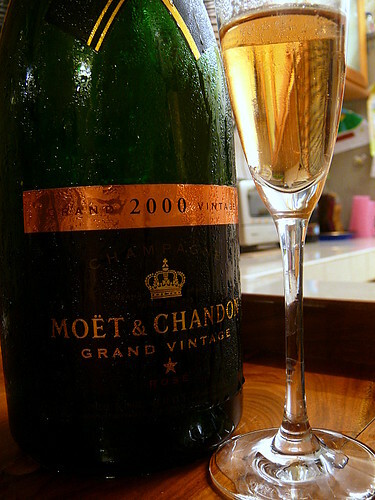 This champagne is absolutely delightful, full of bubbles and not a bit sour. I'm sold. No more cheap bubbles for me. The kids had a prawn penne dish, very subtle and light which Wey wasn't used to. I stole a few bites and wished it was part of our menu too. 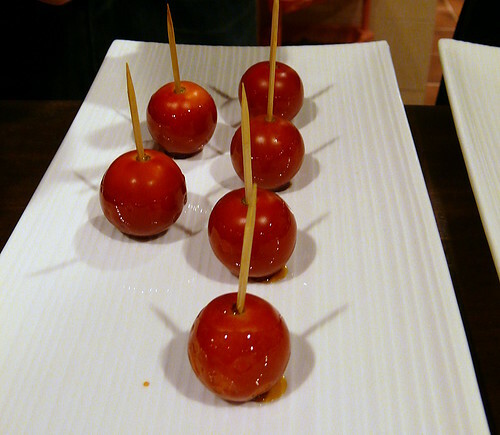 Appetizer was candied cherry tomatoes, lightly sweet outside to balance the slight sourness inside, crisp outside to crunch with the liquid inside. Now this looks simple, and I'm sure most of us can do a version of this. But you'd have to get the toffee to coat to the perfect thickness so that it won't be too thick to chew or too thin to not be tasted, and the sugar to taste just right, not too sweet or bitter. This was truly amazing: a medium-thick broth of prawns heads and shells that had been brewing all day until it was reduced to a small amount. It had the flavor of lobster bisque, only more intense. Absolutely lovely. If I were to do this, I don't think I could get the taste right. 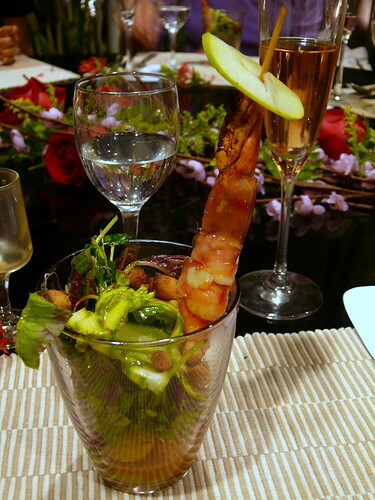 This salad was perfect served in a glass, because the flavors of the salad are layered--you first start with the greens (William, like all good chefs, used local ingredients. 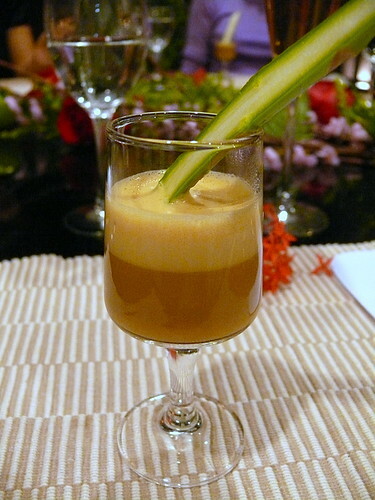 He ditched mesclun and rocket, which are pricey here, and used--surprise--local red bayam and pea sprouts) dressed in a beautiful orange sauce, then to the next layer that tastes of basil which refreshes your palate and then to the bottom of the glass where an avocado and orange paste awaits. Along the way, you munch on the grilled tiger prawn, fresh, sweet and perfectly cooked with a superb orange sauce (Jo, I need this recipe!) that had been reduced from hours of simmering. William specializes in seafood and pastries, and for our mains, he dared cooked local tuna. I have never cooked local tuna well, and I avoid eating it too because cooked tuna steaks are often hard and dry, tasting like wood I imagine. I wished I had watched William cook this, because the tuna was just cooked, about 95%, and again, I've noticed, William was excellent in controlling the taste and the salt level. 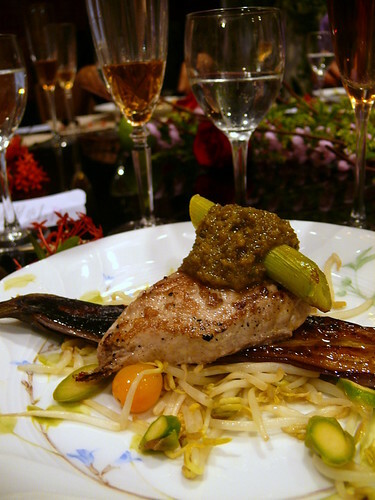 A superb piece of fish, served unexpectedly on bean sprouts and sauteed brinjals, topped with a sauteed leek and a secret tangy sauce. Have you noticed that we weren't served any starch? Is that why the French are so slim as versus the Italians (all those pasta and cheese)? But what about those devilishly delicious French pastries? 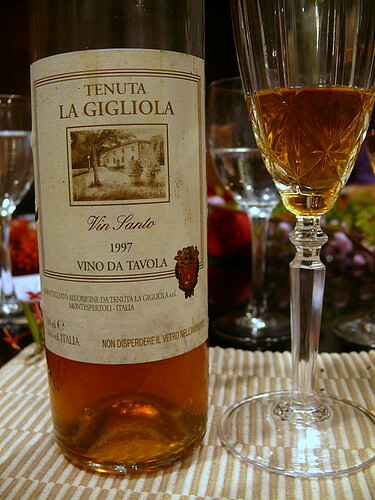 This bottle of vin santo 'holy wine', a dessert wine that's sweet and nearly brandy-like in aroma, was made on the vineyard & farm that Kev and Jo stayed in during their Tuscany trip 4 years ago. 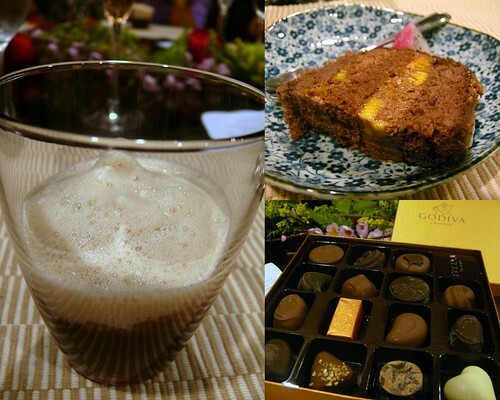 Dessert was all about chocolate: chocolate mousse in a spicy 'soup' topped with milk froth. Hmm. I generally dislike mousse, especially when it's very foamy light yet gelatiny-firm. This mousse was not moussy, more like a soft choc cream so it was okay for me. We were also spoilt by a box of Godiva chocs, and lastly, I dared present a banana-choc cake which was based on a version from Lorrine of Ganache. We had no idea what song to sing when the young lau fu lau chi couple cut the cake and Jo requested for that oversung but most romantic Chinese song, The Moon Symbolises My Heart, lead by none other than my Hub, who has a great (as in nice) voice but never remembers lyrics other than the choruses. 1. Don't overload in quantity. According to Jo, they were worried when shopping with William. We usually load up a truck when we do dinners, don't we, always afraid that there won't be enough food, and we serve too much with too many different meats. 2. You can use local ingredients when cooking western, even French. 3. Keeping the company small means that even though you set the sitting places, everybody can still participate in the conversation. Round tables especially makes this much more easy and pleasant. 4. Having a real professional chef cook for you at home is a decadent luxury. 5. 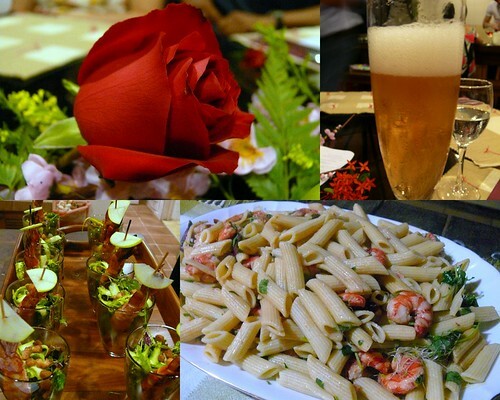 Don't forget the presentation, from the glasses to the flowers to the plates, because that lends to the sense of pleasure and comfort of the dinner. Congrats, Kev and Jo! You have one of the truly happy marriages I know, and my wish is that we'll all be around to celebrate your 60th wedding anni. Food will have to be pureed, but hey, who cares by then? Heather (and William), you have frightened the rest of us off hosting home dinners. It was truly a wonderful and delightful evening and I am very inspired! Can you be my kei nui so you can do my wedding anni dinner too? Wow...very impressive spread! Jo is such a lucky woman!! Must hop over to her blog now to congratulate her. Btw, who is Brian's famous son? Thank you Terri for this lovely post, love the song, it has been ringing in my head the whole day. I was not allow to hold my camera tt night and I think I would be to emo to blog about it. The best part of the dinner was the wonderful company of our friends n family. Tq for the delish choco banana cake. Amazing pictures, bursting with colour! I would love to try something like that some day (but that means meeting a chef like William). Congratulations to Kev and Jo on their wedding anniversary. What a truly marvelous way to celebrate (with family and friends who love them). A lovely song, grace with a wonderful event . . . . an amazing evening! Everything looks beautiful. Many more happy years to Jo and Kev! whoa..what a loving couple and anniversary dinner! :) so glad u all had a great time that night. that was our only aim - to make sure mummy and daddy's eyes shine with happiness, with all their fave people around them. we prepared the contents, but u all made it truly special. you know what they say - the company is what makes the party. shan:ok, i must make a trip there n tell u about it. 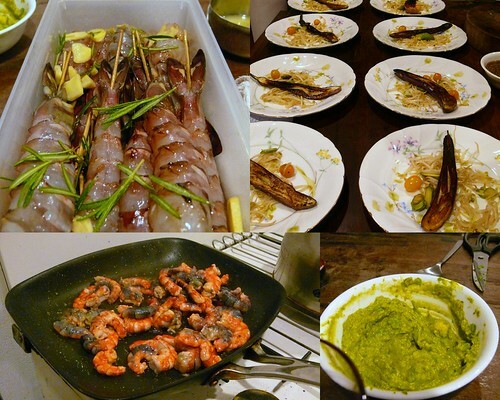 a feast: truly wonderful night, thanks for inviting! ll: i'm sure u have chefs lining up to cook 4 u! kim: on K & J's behalf, thanx! daisyfused: have u got a photo of the cake? i do rmber making u ur 21st bday cake, but i don't rmber the design. Arrrgghh! What a small small world! I know Kev & Jo since I was a kid - and they still look the SAME! I was so impressed with the friends and the life you have over in KK....I don't know KK very well but reading thru your blog making me feel how life should be. How wonderful friend and family can be so meaningful in one's life and your blog make me see it all. Thanks and pleasure reading your blog!! Wish you well and take care! !